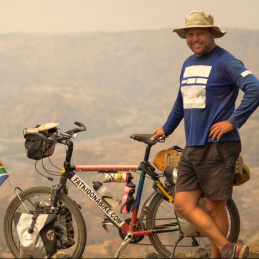 On the 30th June 2013, after selling everything he owned, 20kg overweight, alone and unaided, and with no ‘adventure’ experience, Ron Rutland left Cape Town Stadium on his bicycle to fulfil a lifelong dream and embark on a world first…a single continuous journey cycling through every country on mainland Africa. 42,000km, 841 days, and 75 countries later, Ron arrived in Brighton, UK on the 17th Sept 2015 in time to watch Japan beat the Springboks in their opening game of the RWC…an historic end to an historic journey! In his uniquely self-deprecating and humours manner, Ron has inspired and motivated audiences in South Africa, and around the world, with his tales from the road, and what it took for the most ordinary and unlikely person to achieve something quite extraordinary. Drawing on his experiences from some of the most inhospitable environments on the planet, Ron share’s the tangible ‘real life’ lessons he learnt chasing, and ultimately reaching, the most audacious goal imaginable. * An ‘alternative’ view of Africa!